The Office of Emergency Management (OEM) is tasked with creating a culture of emergency preparedness and response across the University. OEM is responsible for coordinating a comprehensive, all-hazards approach through all cycles of an emergency —preparedness, response, recovery, and mitigation. In addition to University-wide efforts, OEM is available to provide guidance for departments and colleges developing and improving their emergency plans. It is recommended that everyone acquire 3 emergency kits: one for home, one for the car, and one for work. Kits containing all the essential emergency supplies can be bought online or in stores. However, it is important to customize each kit according to you and your household’s needs. Click here for a suggested list of items for your Emergency Preparedness Kit. UTA voluntarily complies with federal standards of responder training. The Office of Emergency Management provides essential personnel with specialized training that encompasses their emergency response roles and responsibilities. Incident Command System training is required for University personnel with emergency response duties per the National Incident Management System. Training requirements vary based on an individual’s role, but in general, IS-100 and IS-700 are required for all emergency response personnel. Those who report to the Emergency Operations Center are required to complete IS-100c, IS-200.b, IS-700.a and IS-800.b. For more specific guidance, please contact Office of Emergency Management at 817.272.0119. IS-100c: Introduction to the Incident Command System, introduces the Incident Command System (ICS) and provides the foundation for higher level ICS training. This course describes the history, features and principles, and organizational structure of the Incident Command System. It also explains the relationship between ICS and the National Incident Management System (NIMS). IS-200.b: ICS for Single Resources and Initial Action Incidents is designed to enable personnel to operate efficiently during an incident or event within the Incident Command System. ICS-200 provides training on and resources for personnel who are likely to assume a supervisory position within the structure. IS-700.b: National Incident Management System (NIMS), an Introduction introduces and overviews the National Incident Management System. The course provides a consistent nationwide template to enable all government, private-sector, and nongovernmental organizations to work together during domestic incidents. IS-800.c: National Response Framework, an Introduction provides an introduction to the National Response Framework. Drills: Fire drills are on a rotating schedule and each building will be tested at least once a year. Exercises: Exercises test the plans with internal and external stakeholders and identifies gaps and lessons learned. Once the exercise is over, the plan is reviewed and edited to reflect any issues or resolutions that may have occurred in the specific exercise. Actual Events: When an unplanned incident such as severe weather or power outages occur, the plan is activated and essential personnel are tested by the way they respond to the incident. UTA employs a multi-tiered emergency communication system to keep our community informed about emergency situations and rapidly changing conditions, from hazardous weather and campus closures to building emergencies and life-threatening criminal activity. We use the MavAlert Emergency Notification System which sends out early warning text and voice messages to phones, email accounts, and other registered communication devices. Students, faculty, and staff should update their phone numbers through MyMav at uta.edu/mymav. UTA guests, visitors and others who plan to be on campus may sign up to receive MavAlerts on the guest registration page. YOU MUST ENTER A MOBILE PHONE NUMBER in your online MyMav record and label it "Mobile" to enable MavAlert emergency notifications via text message. Log in to uta.edu/mymav with your regular network ID and password. Click on "Sign up for MavAlerts" in the far right column. Click on the green “Add a phone number” button. Pull the drop down menu under Phone Type to label the number "Mobile." Click "Save" to save your mobile phone and enable it for text messaging. Please note: Students, faculty, and staff may opt out of receiving MavAlert emergency text messages by logging into MyMav at uta.edu/mymav and following the "MavAlert Opt-Out" link in the right column of the page. MavAlert emergency notifications are sent to all uta.edu email addresses. This campus-wide loudspeaker system is activated by campus police dispatchers in the event of a life-threatening emergency. The University’s outdoor warning system consists of a combination of chimes and prerecorded announcements. The Outdoor Warning System (sirens) is used to warn the campus of an approaching hazard such as severe thunderstorms or tornadoes. To quickly spread essential information, campus closings and emergency notifications are provided to external media including television and radio stations and online news sites. Important information about campus closings and other critical situations is available at 866-258-4913. The links below have valuable information regarding threats that may affect our community. Stay one step ahead and educate yourself on how to react in these circumstances. 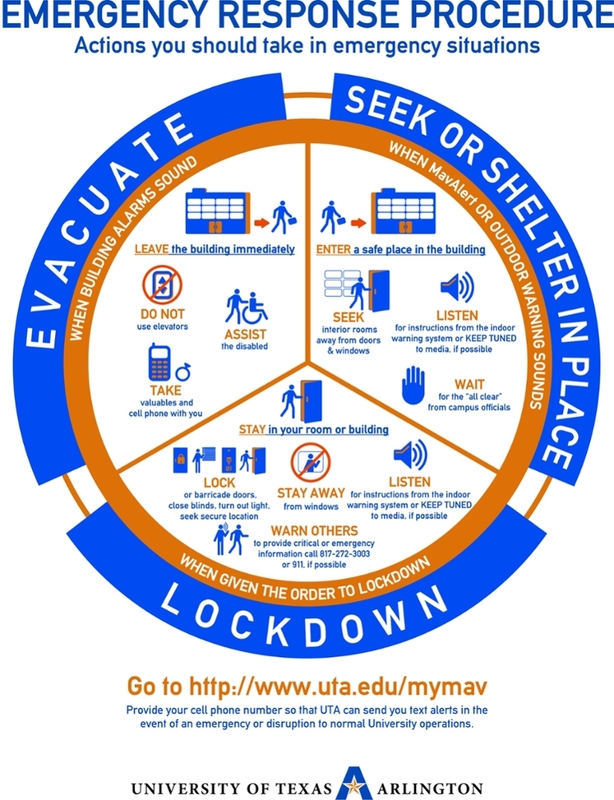 These plans outline the University of Texas at Arlington's approach to emergency operations. They represent a series of best practice guidelines, and provide general guidance for emergency management activities and an overview of UT Arlington's methods of preparedness, response, recovery, and mitigation. All plans below are provided in PDF format. Past unexpected events on the campus such as floods, fires, and damaged server rooms, resulted in departments relocating operations, halting services, or suffering permanent data loss. Business continuity is our preparation for these and other unexpected disruptions to continue to provide our essential services with as little disruption as possible. The mission of the University of Texas at Arlington’s Business Continuity Program is to establish and support an on-going contingency planning program to evaluate the impact of significant events that may adversely affect students, faculty, staff, and assets. The goals for successful business continuity planning are that each Vice President/Provost, Dean, Director, Department Chair, or Supervisor assumes responsibility for the operational continuity in their respective units. What is UT Arlington Ready? An online tool that has been implemented to store and create plans via its Business Impact Analysis (BIA) tools. Access the UT Arlington Ready Guidebook, Interview Form, Review Sheet, Step by Step Process, and Frequently Asked Questions. Access your plan by clicking here UT Arlington Ready. How does business continuity planning fit in with other plans? Business continuity is different from Emergency Management. Emergency Management secures life and safety in response to a disaster or emergency. A Business Continuity Plan is used once life and safety are secure and is used to help you to continue your operations. We face many risks to our work and these risks affect our opportunities and our abilities. Our community and our coworkers depend on us to take steps to protect UTA. What we do today will determine what our lives are like tomorrow. What is my role regarding a plan? As a leader for your department, determine who will coordinate the planning process for your department and contact Cindy Mohat, Business Continuity Planner, to set up an introductory meeting. As a staff member, you have valuable insight into the operations of your department and in the future might serve on a planning team to assist with creating plans. How do I get my plan started? Contact the Business Continuity Planner, Cindy Mohat at mohat@uta.edu, to arrange an introductory meeting. After the meeting, you will be given access to the UT Arlington Ready Tool. Once you have been given access, you can login to begin your plan. A short video was created to explain to faculty, staff, and students what to do if there is an active aggressor is on campus, where to go in an evacuation, or what to do when you shelter-in-place. Emphasizing the diversity of the whole community, this preparedness video strives to make UTA a safer, stronger community during a disaster. This program promotes Think, Prepare, and Act strategies to enable you to become prepared for any incident. There are many hazards that face the university. It is important to be able to identify them and know what to do if they were to occur. The Office of Emergency Management encourages students, facility, and staff to learn more about the hazards that we could face every day and to be able to respond effectively. Do you have the skills needed to prepare, survive and recover from a natural disaster? Join Dante Shields, the internationally famous disaster specialist, and his genius prodigy, Mika, in the high-tech holographic simulation games-Disaster Hero. Compete against the members of Dante's elite disaster specialist team in four different disaster scenarios; earthquakes, tornadoes, hurricanes, and floods. If you can prove victorious then you could become the next Disaster Hero! This video, recently produced by the Houston (Texas) Mayor's Office of Public Safety and Homeland Security, dramatizes an active shooter incident in the workplace. Its purpose is to educate the public on how to respond during such an incident. MavAlert keeps the University community informed in the event of a campus emergency by sending early warning text and voice messages to phones, email accounts, and other registered communications devices.